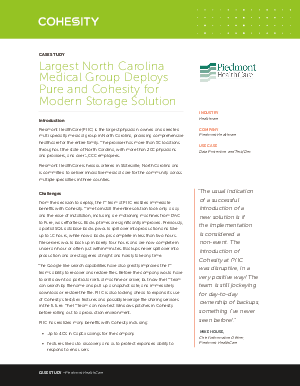 Piedmont Healthcare, a healthcare leader in North Carolina, chose Cohesity to meet explosive data growth demands and future requirements for secondary data management. PHC has realized many benefits with Cohesity including: • Up to 40% in CapEx savings for the company • The company saw a 2:1 data reduction ratio with Cohesity, freeing up more than 60% of its storage cluster and seeing great capacity benefit with Cohesity data deduplication • Upgrades are now possible without bringing down a machine, and without outside vendor assistance in significantly less time and with no excess cost. Read this case study to learn more.